Rachelle Lefevre was born and raised in Montréal, but currently lives in Los Angeles to work in television and continue to pursue her growing film career. She got her show business break when she landed an audition with the help of a loyal customer at the sushi restaurant where she worked. The show was the FOX Family Channel series Big Wolf on Campus. Though she had no film or television credits to her name and used a polaroid picture as her headshot, the producers called her back for a second audition and she ended up landing a lead role. Rachelle Lefevre played the role of Julia Shumway on the series, Under the Dome. She joined the cast of Mary Kills People in 2018 playing the role of Olivia Bloom. 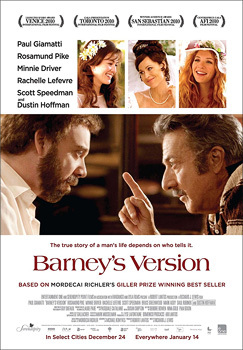 Poster for Barney’s Version © 2010 Serendipity Point Films − All right reserved.